The 2012 San Diego City Council election occurred on November 6, 2012. The primary election was held on June 5, 2012. This was the first San Diego City Council election to use nine council districts. Five of the nine seats were contested. Two incumbents ran for reelection in their same district and one ran for election in the newly created ninth district. 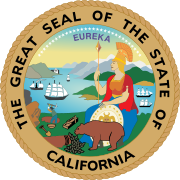 Municipal elections in California are officially non-partisan, although most members do identify a party preference. A two-round system was used for the election, starting with a primary in June followed by a runoff in November between the top-two candidates if no candidate received a majority of the votes in the first round. The 2012 election was the first to use the new districts created by the 2010 Redistricting Commission. Seats in districts 1, 3, 5, 7, and 9 were up for election. Carl DeMaio did not run for re-election when his term expired in 2012; he was replaced by Mark Kersey, who ran unopposed for the District 5 seat. Scott Sherman was narrowly elected in June to the District 7 seat, which had no incumbent. Todd Gloria (District 3) and Marti Emerald (District 9) won re-election by getting more than 50% in the June primary. Sherri Lightner (District 1) was forced into a November runoff which she won, 55% to 45%. During the 2012 election cycle the local Republican Party made a strong bid to take over the majority on the (officially nonpartisan) city council. They ran a coordinated slate of three candidates, of whom Mark Kersey and Scott Sherman were elected to seats with no incumbent, but Ray Ellis lost to incumbent Sherri Lightner, so that the council maintained a partisan balance of five Democrats and four Republicans. District 1 consists of the communities of Carmel Valley, Del Mar Mesa, Del Mar Heights, La Jolla, Pacific Highlands Ranch, Torrey Hills, Torrey Pines, and University City. Incumbent council member Sherri Lightner ran for reelection. Although she received fewer votes than Ray Ellis in the June primary, she was reelected with a majority of the vote in the November general election. District 3 consists of the communities of Balboa Park, Bankers Hill/Park West, Downtown San Diego, Golden Hill, Hillcrest, Little Italy, Mission Hills, Normal Heights, North Park, Old Town, South Park, and University Heights. Incumbent council member Todd Gloria ran for reelection unopposed. District 5 consists of the neighborhoods of Black Mountain Ranch, Carmel Mountain Ranch, Miramar, Rancho Bernardo, Rancho Encantada, Rancho Peñasquitos, Sabre Springs, San Pasqual Valley, Scripps Ranch, and Torrey Highlands. Incumbent council member Carl DeMaio chose not run for reelection so that he could instead run for mayor of San Diego. Mark Kersey ran for the empty seat unopposed. 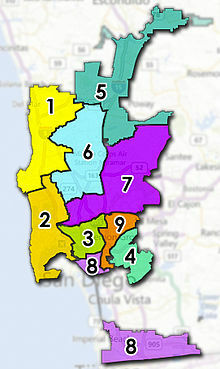 District 7 consists of the neighborhoods of Allied Gardens, Del Cerro, Grantville, Linda Vista, Mission Valley, San Carlos, Serra Mesa, and Tierrasanta. Incumbent council member Marti Emerald chose to run for reelection in the newly created district 9 instead of district 7. Scott Sherman was elected with a majority of the vote in the June primary. District 9 consists of the communities of Alvarado Estates, City Heights, College Area, College View Estates, El Cerrito, Kensington, Mountain View, Mount Hope, Rolando, Southcrest, and Talmadge. Incumbent council member from district 7 Marti Emerald chose to run for reelection in the newly created district 9. She was elected with a majority of the vote in the June primary election. The new city council was sworn in December 3, 2012. The week after the election, Council President Tony Young announced that he would resign from the City Council to become CEO of the San Diego-Imperial Counties chapter of the American Red Cross. His resignation on January 1, 2013 triggered a special election for the balance of his term, which ends in 2014. At its first meeting the Council unanimously elected Todd Gloria to succeed him as Council President. On May 21, 2013 Myrtle Cole was elected to finish the remainder of Young's term. ^ "County of San Diego, Presidential Primary Election, Tuesday, June 5, 2012" (PDF). San Diego County Registrar of Voters. Retrieved 9 November 2012. ^ "County of San Diego Presidential General Election, Tuesday, November 6, 2012". San Diego County Registrar of Voters. Retrieved 9 November 2012. ^ Gustafson, Craig (November 19, 2011). "Republicans seek majority on San Diego council". San Diego Union Tribune. Retrieved 9 November 2012. ^ "Election History - Council District 1" (PDF). City of San Diego. Retrieved 12 January 2013. ^ "Election History - Council District 3" (PDF). City of San Diego. Retrieved 12 January 2013. ^ "Election History - Council District 5" (PDF). City of San Diego. Retrieved 12 January 2013. ^ "Election History - Council District 7" (PDF). City of San Diego. Retrieved 12 January 2013. ^ "Election History - Council District 9" (PDF). City of San Diego. Retrieved 12 January 2013. ^ "Council President Tony Young to Vacate Seat, Work for Red Cross". NBC 7 San Diego. November 17, 2012. Retrieved 19 November 2012. ^ "Gloria succeeds Young as City Council president". CBS-8. December 3, 2012. Retrieved 5 December 2012. ^ Gustafson, Craig (21 May 2013). "Cole defeats Crenshaw in District 4 council race". UT San Diego. Retrieved 22 May 2013.